John Lasseter, head of Pixar and Walt Disney Animation, is the latest Hollywood power player to be embroiled in a sexual harassment scandal, with a new report claiming his behavior affected the highly-anticipated sequel Toy Story 4. 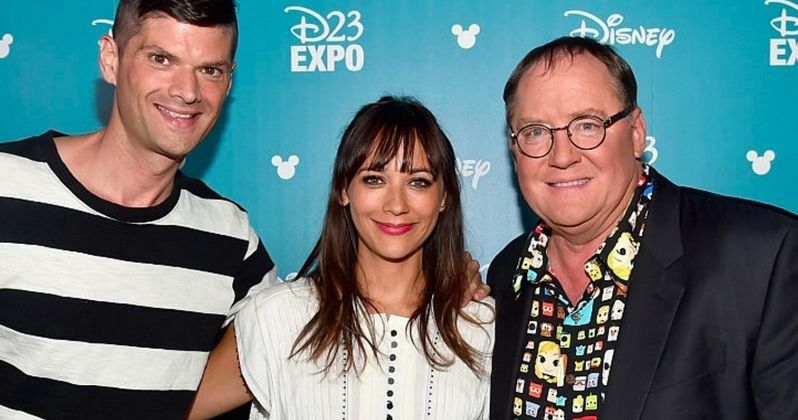 It has been revealed that original Toy Story 4 writers Rashida Jones and Will McCormack left the project shortly after they were announced as the screenwriters, after John Lasseter made an unwanted advance. Neither Rashida Jones nor Will McCormack commented on the story, while a Pixar rep claimed their departure was due to "creative differences." Both Rashida Jones and Will McCormack are still credited as the Toy Story 4 writers on the movie's IMDB page. This report doesn't offer any specific details about what this "unwanted advance" may have been, but if it happened shortly after they came aboard, it likely happened more than three years ago. Toy Story 4 was first announced in early November 2014, when it was revealed that John Lasseter would also serve as director, marking his first time at the helm of a movie since 2011's Cars 2. There were never any reports that Rashida Jones and Will McCormack had left the project, but in March 2015, it was confirmed that John Lasseter would get a Toy Story 4 co-director in Josh Cooley, making his feature directorial debut after directing the 2015 Inside Out short film Riley's First Date. What's interesting is, the last we heard about Toy Story 4 was in July, when, during the D23 Expo, it was confirmed that Toy Story 4 lost director John Lasseter, although no specific reasons were given for his departure. It was said at the D23 Expo that Josh Cooley would in fact work very closely with John Lasseter on the project, but Lasseter won't be involved as a director. It seems unlikely that these newfound allegations against the Pixar chief would have had anything to do with him relinquishing his directing duties, since he did so over five months ago, long before these sexual harassment claims went public. Still, it remains to be seen how John Lasseter's leave of absence will have any impact on the production. John Lasseter wrote a memo to his staff today, which was released just as the first report about his sexual misconduct broke. The Pixar executive announced that he was going on a six-month leave of absence that he hoped would give him, "the opportunity to start taking better care of" himself. There were several inside Pixar who spoke to The Hollywood reported, revealing that Lasseter was well known for "grabbing, kissing, and making comments about physical attributes." Others claimed he would "whisper in your ear" when you hugged him while one woman would have to take a "defensive position" when sitting next to Lasseter in meetings, so his hands wouldn't wander. Last October, Pixar swapped the Toy Story 4 release date from June 15, 2018 to June 21, 2019, with The Incredibles 2 taking the June 15, 2018 date. We also reported back in November 2015 that Patricia Arquette was being approached to play a hippie mother in the movie, which will not be connected to the original Toy Story trilogy, and will center on a love story between Woody (Tom Hanks) and Bo Peep (Jodi Benson). You can visit The Hollywood Reporter for more details on the sexual harassment allegations brought forward against John Lasseter.